Santa Claus & Mrs. Claus will appear at the following events open to the public in 2017. Fireworks will be in the northwest parking lot near Macy’s. Santa & Mrs. Claus will arrive in an antique horse drawn sleigh. Santa & Mrs. Claus will be available to greet in Macy’s after the fireworks. A charitable kickoff to the holiday season, featuring shopping, holiday demos, a bevy of bites from fabulous local businesses, complimentary craft cocktails, & more. Judson Center is a nonprofit agency providing autism, behavioral health, child welfare, and disability and foster care services to children in the Metro-Detroit area. This holiday season, Leon & Lulu and Yelp Detroit are working together to ensure that no child in their foster programs goes without a special surprise at Christmas. Santa & Mrs. Claus will meet and greet after broadcast. Santa & Mrs Claus will be available for photos as guests will have individual “lap time” with Santa. Professional photographer will be available for pictures. Mayor will give Santa “Key to the City”. Santa & Mrs Claus to sing Christmas songs. Professional photographer will be available. There will be an opportunity for guests to visit with Santa in the Log House. 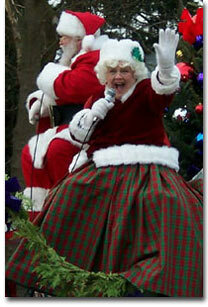 Bring your camera for photo with Santa & Mrs. Claus in the beautiful setting Bordines provides.